LEVEL 1 : Rose tinted glasses, fun and fancy free bliss, all that jazz! 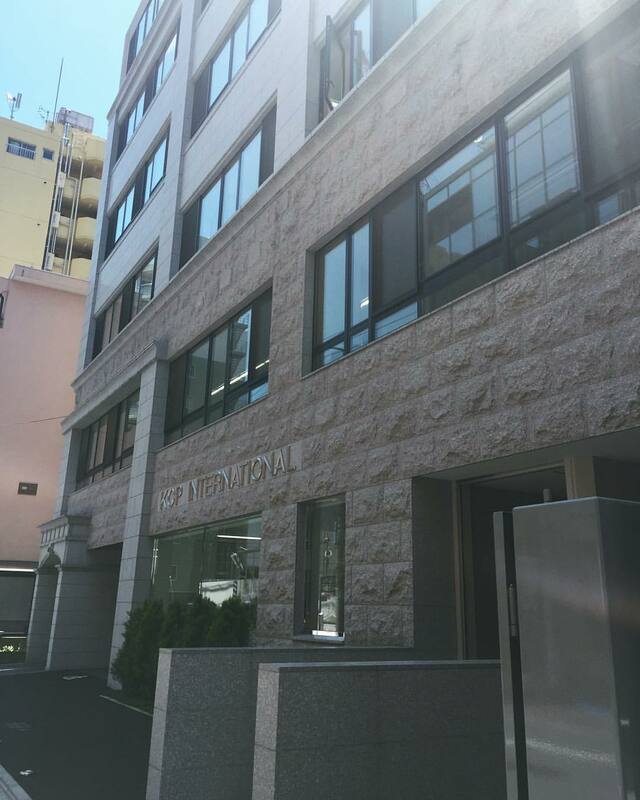 KCP International Japanese Language School (KCP市民地球日本学校), is located right around the corner from Shinjukugyoenmae Station (新宿御苑前駅). Shinjukugyoenmae Park (新宿御苑前公園) is close by too. It really, honest to God, is. They have Levels 1 ~ ? Honestly some of the students are here for so long, I couldn’t tell you what level KCP stops at. When you arrive, they have an orientation and give you a placement test. This helps figure out what level would work best for you. Though, I opted not to take it and started over from level 1. I think I’ve learned so much more starting over at beginner, back in January 2016. Just about all the teachers I have had are great, really dedicated to their classes. 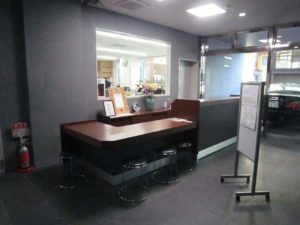 The English-speaking office staff were so helpful with the initial application process, answered all my questions, really helped put my mind at ease. Mind you, I ask(ed) a ton of questions. As soon as I had just finished typing up and sending an email full of questions, I had another one going because I’d thought of something else I forgot to ask in the previous one. I’m sure they were ready to get me here just so I’d stop asking so many questions. This has been my very first experience studying abroad (let alone stepping foot outside my own country), I had to know what to expect, all the just in case of emergencies. Regardless of my worries, the overall process of getting to Japan was pretty smooth. They met us at the airport, then took us to and got us set up in our dorms (which actually were like having your own little apartment to yourself). All of this was like one big sensory overload. Japanese, real live Japanese, just everywhere. I was so nervous, yet crazy excited, it was a childhood dream come true. Thank you very much KCP. The first semester (which runs pretty much the same as the standard, American university semester, 3 months.) was fantastic! As I said, I decided to start over from the very beginning, and I have takenJapanese throughout the years of my life, my first class exposure being 5th grade in elementary school. Then 2 years in high school, and a year and a half in university. (Starting out in university I was an East Asian studies major, but I changed majors.) I already knew all the Hiragana (ひらがな), Katakana (カタカナ), about 200 or so Kanji (漢字), vocabulary (単語), and basic grammar (文法), so level 1 was a breeze. I studied a bit for the final, otherwise, I was fine. There were also some neat culture trips and classes throughout the first semester. We were taken to some of the more major sights in Tokyo. Even took a weekend trip outside of Tokyo to Kamakura and Enoshima. And, special studies classes, with each class taking place once a week. This could be before class (if you’re in the beginner classes which start 1:30-4:45) or after class (if you’re in the upper intermediate – advanced classes which are from 9:00-12:15). I picked the English Support route in Level 1 and 2, because I was going anyway, in case I had questions. It was kind of helpful, sometimes. I’d wander the streets randomly, finding new places, or trying new things, often with Onjel. (The other writer on this blog.) We went on many day trips around the Tokyo area. Even planned, inviting other dorm folks to come a long, a trip out to Osaka, Kyoto, and Nara. (That was an amazing trip still can’t wait to go back!) I kept so busy, met a lot of amazing people, and went on all the adventures. Time flew and I had great times all around in general. Then Level 1 and Spring break ended and it was back to the grind of KCP again. I had passed and moved up to level 2. Now, level 2 wasn’t all that bad either, actually. There was a lot of new things I had never studied before, but it wasn’t impossible. Some things did trip me up here and there though. But for the most part, I could apply myself a bit more and it would click. Actually beginning to feel a bit of the high-pace pressure KCP talks about on their website. It really picked up. I still felt like I had a handle on things regardless. For levels 1-3 at KCP we use a text book called Minna No Nihongo (みんなの日本語). It’s a pretty good book, but I do feel it is best used in a class setting with a teacher to guide you. When we had to work things out in the book, on our own, I tripped up every now and then. Sometimes things were so abstract looking at first, but the teacher would explain later and it would make sense again. To the far right is me, and next to me is Onjel. I did not mention this already but, KCP also has a handful of clubs (Newspaper club, Anime, Comics, and Games club, Tea Ceremony club, and so on. They’ve even got a Bowling club now!) 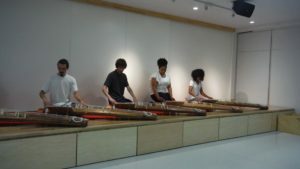 that you can participate in as well, Koto club being one of them. (A koto is a type of long harp like instrument that you sit on the floor while playing.) Almost all of the clubs are pretty easy going, you can join in at any time and any level. Here’s where things also started to take a weird turn for me. (And for other students that came through the the “American” program.) If you’re coming from a country that’s not part of Asia, 9/10 you’ll be in the “American” program. There was a rather significant jump in the language we were expected to know, (and this will be important later) between levels 1 and 2. Like there was some secret studying we were supposed to do over the holiday, and all the other students, particularly everyone else who wasn’t in the “American” program, seemed to know. Or maybe they were bluffing, or this is just how they study out here so they’re used to it, but they always seemed to know everything. Mind you, this would be before we covered anything in class or got taught the new stuff. I suppose this could come from the different classes other students get to take that we did not. Most students from other Asian countries are on a get-into-university-or-college type course. This is fine and dandy but, it seemed like their other classes were much more practical and helpful. Most “American” program students aren’t coming here to get into university. They’ve got degrees, or are already enrolled and working on a degree. Many do not stay long term, maybe 1-3 semesters. They’re here for more of an experience. I get that some of these others class options don’t apply to us but the option, to learn or take those extra classes if there is interest, would have been nice and should be there, in my opinion. This is this brings me to the why I feel this way. Mind you, we came to find this out upsetting truth towards the end of the semester in Level 2, maybe beginning of Level 3 (just about 6-9 months in). 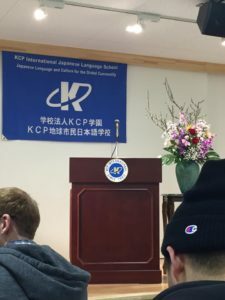 The “American” program at KCP, the only KCP program option that comes up in English when you find this language school, cost about 2-4X as much as what the other students pay for their course (students that come from S. Korea, China, Malaysia, Thailand, etc). Yes, you did read this correctly. 2-4X more. 2 TO 4 TIMES MORE. Why? With the first semester I get it, we’ve got the Saturday culture classes, little events here and there, mini trips, the big weekend trip to Enoshima and Kamakura, and what have you. But! After that first semester you are here you don’t have the culture classes anymore, you don’t go on the trips, none of that, and the price does not change. Why is that? Why is it still so much more expensive? I have tried to do the math and I just cannot quite figure it out. Even if you’re staying in their school dorms, with the special studies class, English support, even then, it shouldn’t cost so much. Especially not so drastically different than what the other students pay. In the “American” program we pay about $6,700 for a semester at KCP and living in the dorms. If you opt to not use KCP housing, and find your own place, the “American” program goes down to $2,900 I believe, but the regular students pay roughly $1,500. This not advertised on the English site, the only way you would see these prices is if you can already read Japanese, and or Chinese, Korean, Thai, etc. Now, say you do find out about this difference in price AFTER you get here (and have already paid that first arm and leg) and you want to switch out of the “American” program. That is possible, but they’re pretty cold about it, and you definitely see a big attitude change from that point on. NOTE: If you decide to come through a university and take credits through KCP (because financial aid is possible this way) you cannot switch out of the “American” program. Otherwise you won’t get the credits or financial aid. So. You’re stuck. The rug of innocent bliss in KCP and Japan was tugged from under my feet. It was really felt like they were withholding this information. I don’t know about you, but I’m not made of money. I do not come from money. I got help from mama and pops, but we do not have money to blow like that. It was tough, and I had to work hard to save all I could to make it out here. And now that I’m here, I have a part-time job so I can continue to afford to stay here. Paying $4,000 more than other students, having those other options purposefully hidden? Nope. But, on top off it, I am taking these classes for credit through a university. Which means I can’t even switch out and pay less? Strike! KCP. Even though I was off-balanced a bit by this revelation, I made it through Level 2 without too many issues. I passed and moved onto Level 3. Now 6 months of language school and living in Japan done, completed, while still feeling pretty motivated and ready to take on whatever comes next. Bring it on Japan, bring it on KCP! ~Anything I write or say are based on my own experiences. Not a one size fits all kind of thing. That being said, I would not trade my experience at KCP, for the world. Thus I will share, the good, the bad, and the ugly. Even if it comes off as a bit of a rant.